Orchha is one of the few places in India that combines natural beauty, the aesthetic legacy of history and a certain authenticity. 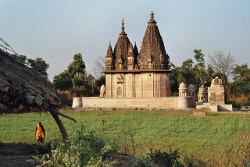 Orchha is in transition from village to town and many of its smaller temples throne over well-tended fields. It's a paradise for bird watchers with a wide variety of colourful birds often making an appearance. Life in Orchha revolves around the Ram temple where one can see how vibrant Hinduism remains today. Orchha's rapid development brings with it the chaos rooted in the lack of urban planning that is typical of India... inadequate roads, non-existent or choked drains and fast accumulating piles of waste. Being a small town of about 10,000 inhabitants, these problems are not insurmountable but require a strong dose of good governance and transparency in the use of public money. That is why the strengthening of local democracy is so important. So is the empowerment of the women of Orchha who remain constrained by traditional attitudes concerning their roles and capabilities. Meeting women from other cultures has made them aspire to more independence for their daughters.